This site is not an official website for the track shown here and is neither approved or endorsed by the speedway team. 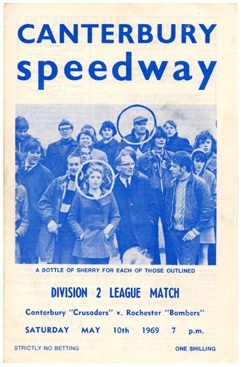 Speedway racing first came to the Kingsmead Stadium in Canterbury in 1968. At that first meeting, held on 18th May 1968, a crowd in excess of 7000 attended, but they were to witness a defeat for their new heroes by 39-38 against Belle Vue Aces. In 1975 Canterbury were one of the founder members of the New National League when Willy Mawdsley, later of Bristol and Arena-Essex fame, managed the team. The team remained in operation until 1987 when, on the 31st October, the final match saw Canterbury defeat Rye House by 49-29. The team won the Knockout Cup in 1968 and were League Champions twice, in 1970 and again in 1978. Greyhound racing first took place at the track, replacing speedway, in 1988. A number of very successful years meetings were held at the track, and many dogs from the track enjoyed Open race successes. However, the Council-owned track closed its doors on 30th October 1999, and some 2 years later the football club ceased being. The team has always been nicknamed the Crusaders. A further great source of information is provided on John Skinner's excellent website on Defunct Speedway tracks, with a link given below. or email johnwslusar@gmail.com for inclusion of your comments and photos of speedway on this website.